Chipmunks have massive cheek pouches for moving food from one place to another for later use. Like hamsters and ground squirrels, they're instinctive savers. 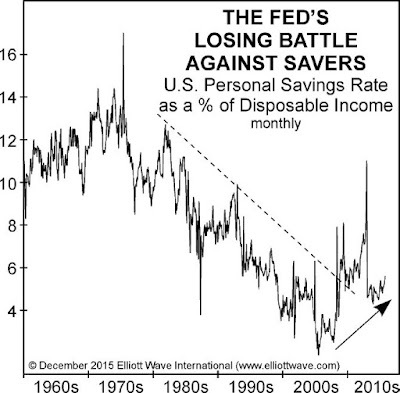 On the other hand, the savings habits of human beings are not so innate. Sometimes we store away less than at other times, depending on whether we're feeling optimistic or pessimistic. These days, U.S. residents are feeling uncertain about the future. In October, the U.S. personal savings rate as a percentage of disposable income rose to 5.6%, its highest level in almost three years. ... Back in 1999, by contrast, households were emptying their piggy banks to jump into stocks and other assets. 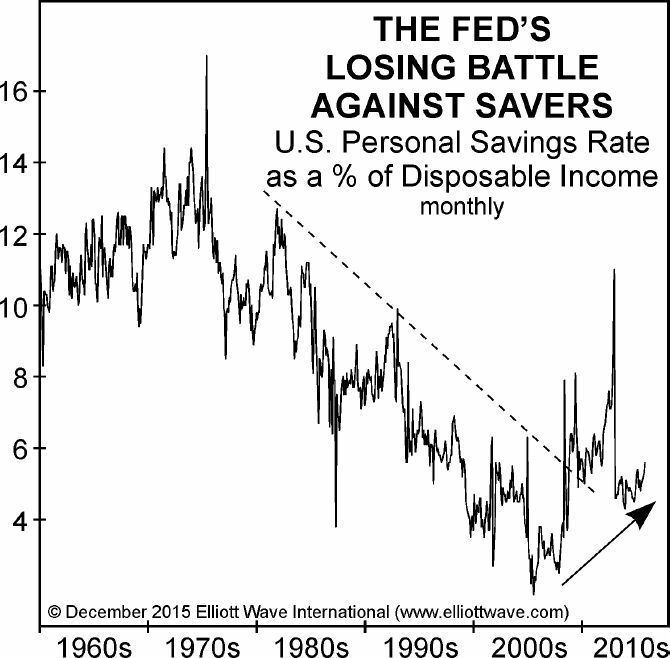 The trend continued until July 2005, when the savings rate hit a low of 1.9%. Naturally, the percentage rose as the 2007-2009 bear market grabbed hold, but over the course of the subsequent rally in stocks, a critical divergence has developed, as the chart shows. It suggests that the Federal Reserve is failing in its effort to flush people into riskier financial assets. It's notable that this ramped-up level of cash stashing is occurring even as incomes have risen. Another sign of a growing financial conservatism is that consumers are spending less. ShopperTrak says in-store retail sales on Black Friday weekend declined by 10.4% vs. a year ago. As you can see, total retail and food service sales declined from more than 8% growth starting in 2011 to just 1.7% in the latest available quarter. The bottom graph shows that online sales growth exhibited no strong upturn. Back in 2007, the transition from risk-taking to conservatism started off gradually. But, in November of that year, the transition suddenly accelerated. Is that what's set to occur as the markets and economy go into 2016? Learn more on this topic from a new FREE report from Elliott Wave International's urgent report: Risk ON? Risk OFF? Find Out Where Your Money Lies. Steve Hochberg and Pete Kendall have been tracking a "steady global shift to greater financial conservatism over the last 18 months." They have just published this new report detailing all of their findings. This article was syndicated by Elliott Wave International and was originally published under the headline Conservatism Grips the U.S. Economy Like Squirrels Hoarding Nuts for Winter. EWI is the world's largest market forecasting firm. Its staff of full-time analysts led by Chartered Market Technician Robert Prechter provides 24-hour-a-day market analysis to institutional and private investors around the world.